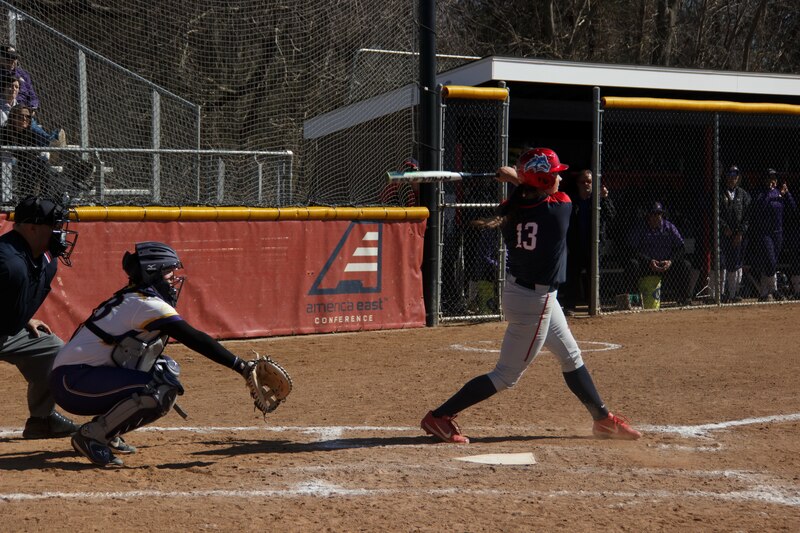 The Stony Brook softball team’s three-game winning streak came to an end Sunday afternoon at University Field in a 4-0 loss against the Sacred Heart Pioneers. The shutout loss came after Stony Brook defeated Sacred Heart 3-2 in the first half of a double header. The Seawolves got off to a strong start in the opening game of the double header, which began at 1 p.m. After a scoreless first inning, sophomore outfielder Jourdin Hering doubled to left field, scoring senior infielder Chelsea Evans and sophomore infielder Riley Craig. In the following at bat, senior outfielder Ileana Torres hit an RBI single to bring home freshman infielder Nicole McCarvill to extend the Stony Brook lead to 3-0. Sacred Heart junior starting pitcher Kristen McCann stifled the Stony Brook offense over the next four innings, holding it to only two hits in and leaving both stranded on base. The Pioneers did not let McCann’s efforts go to waste, chipping away at the Seawolves’ lead in a sixth inning comeback attempt. Freshman infielder Caroline Kruger came up to bat with two players on base in the top of the inning. Kruger recorded a hit, scoring junior infielder Hailey Desrosiers on a fielder’s choice and reaching first base. Two batters later, sophomore utility player Cierra Casale sent sophomore infielder Katelyn Christian home with a single, cutting the Stony Brook advantage to a single run. The Pioneers managed two hits in the top of the seventh, but Seawolves sophomore starting pitcher Melissa Rahrich was able to end the comeback attempt and secure a 3-2 win for her team. Unfortunately for Stony Brook, Sacred Heart’s momentum from the end of game one carried over into its game two efforts. The Seawolves managed just two hits in seven innings against Pioneers junior starting pitcher Emily Orosco. Sacred Heart had a much easier time at the plate, however, scoring twice on two hits against Stony Brook sophomore starting pitcher Taylor Pechin before chasing her out of the game after five innings. Pechin was replaced by senior pitcher Maddy Neales, who struggled as well, giving up two runs on four hits. The Seawolves will next take the field Wednesday, April 11 for a double header with the UMBC Retrievers at UMBC Softball Stadium. The Retrievers are currently sixth in the America East softball standings and will enter the double header on a two-game losing streak. The opening pitch of game one is scheduled for 1 p.m.